Self-healing materials (SHM) are materials that can recover itself from damage, due to mechanical exposure or stimulus from the outside. This means that the material can recover on itself but can recover by adding heat. How do Self-Healing Materials work? 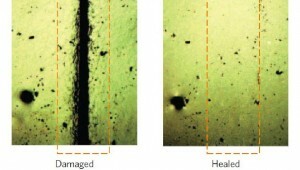 The process of self-healing is made possible by the materials added. This can be applied to virtually any material group. 1. First of all, a material will be damaged. 2. Then, the material must detect where the damage is located. 3. The repair is carried out: a chemical reaction creates material or original bonds are recovering. Which technics are used for SHM? It is possible to add capsules to the base material. Usually polymers. If the material is damaged, the capsules are also damaged, through which the contents of the capsule fills the damaged area. The content of the capsule may consist of glue or a solvent. In the adhesive, there is also a catalyst present. When the capsule breaks open, the glue hardens under the influence of the catalyst. When using a solvent, the glass transition temperature is lowered locally. As a result, the chains become more mobile at the same temperature. This allows the material to flow into each other and there are new bindings established. This on its turn makes the material hard. The strength of the material remains the same as the strength of the original material. Self-healing car paint and asphalt are examples of the latter technique. The application of a vascular network: a type of structure such as vessels in the human body, but one that passes through the material. Because these vessels are liquid. The vascular network is achieved when there is an occurrence of damage. By capillary action, the liquid runs into the damage and then heals the material. With this method, larger damages can be repaired thanks to the use of capsules. The use of vascular networks can be found in many applications in the air and space. Applications: hollow glass fiber composites, polymers. 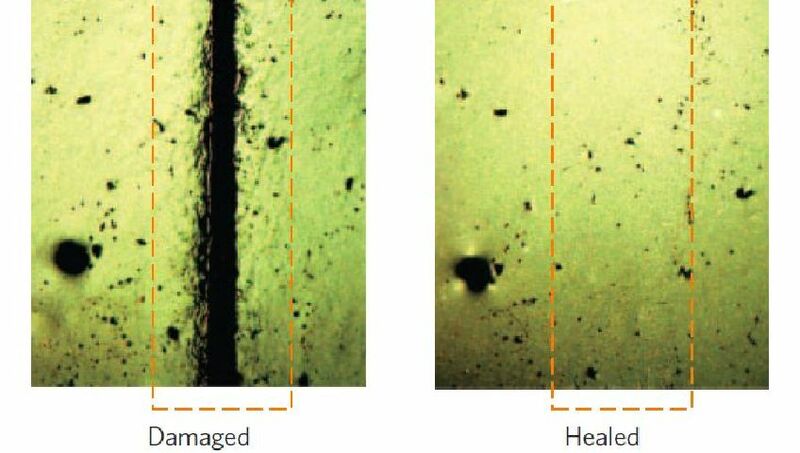 The process and treatment of self-healing materials is the same as in ordinary materials. De technique depends on the material. In what situations are recovering materials useful? In places where repairs are a nuisance to people, such as roadwork; In High-tech equipment products which may not sustain any damage, such as glasses, smartphones etcetera.